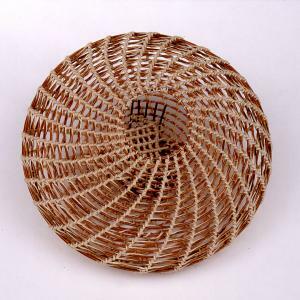 Sue Fedenia is an artist who uses reed, waxed linen and basketry techniques to create sculpture. In June 1976, my daughters and I traveled to Powderhorn Ski Lodge on Grand Mesa on Colorado's Western Slope so I could teach a Stitchery Workshop. That is where I discovered coiled basketry in a workshop I took. I was hooked! I have been working in the coiled basketry technique ever since; first with yarn and fuzzy materials, then later simplifying to the materials I use now: reed and waxed linen. I have added color with painted and/or stained reed and dyed waxed linen. I have added layers with baskets in baskets. Currently, I am fascinated by using colors in a painterly way with the Southwestern Sky as my subject. For more information on my baskets (prices, availability, etc.) please email me at s_fedenia@hotmail.com.